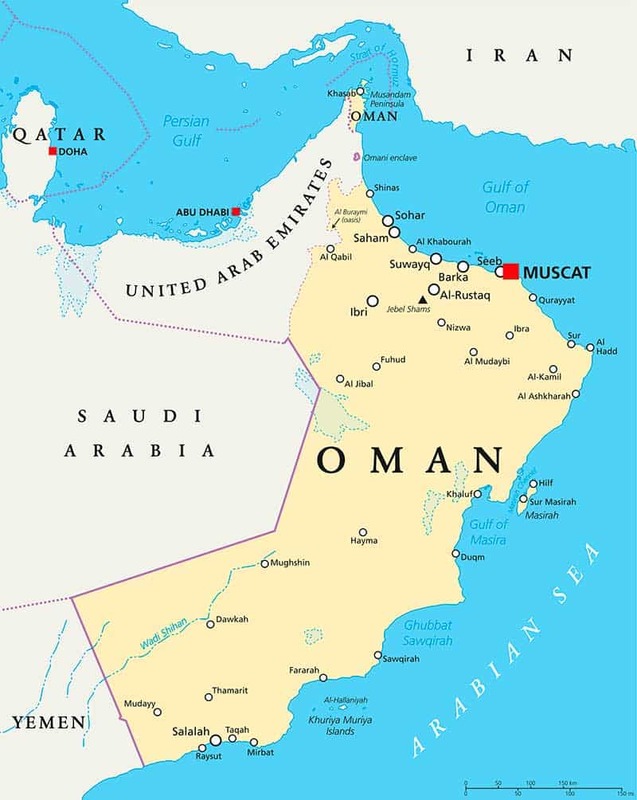 Oman, or officially the Sultanate of Oman, has wide open dry river valleys, beautiful coastlines, evocative deserts, verdant oases, majestic mountains, and the wonderful port capital of Muscat. Oman has a rich heritage and a fascinating culture, including a lot of Bedouin influences, and maintains many of its traditional charms without the fabulous and somewhat distorting wealth of much of the Arab world. Muscat is a relatively laid back Arabian city, where tradition rubs along cheek by jowel with future optimism. The Sultan has decreed that no new building can be more than seven storeys high (other than a few historic 20 storey buildings) so that the minarets can still tower over their neighbouring edifices. The whitewashed buildings are perfectly framed by the Gulf of Oman and the wonderfully craggy mountains. At the heart of Muscat is the impressive and huge Sultan Qaboos Grand Mosque, with its equally impressive hand-loomed rug that until recently was the largest in the world. A rare mosque that is built to enable access to Westerners. The private collection of historical jewellery, clothing and artefacts in the Bait al Zubair Museum is our favourite museum in Muscat, housed in a lovely traditional building. Muscat boasts an opera house, and while the Omani operatic scene is still very nascent, book one of the regular tours to examine the exquisite craftsmanship up close. Other than Muscat, Nizwa, Oman’s former capital city, is an ancient city situated on a main trading route. Like every Omani province, Nizwa has its own lively livestock market every Friday, with people bringing their animals from far and wide. The city has an imposing fort, with a huge cylindrical tower, that was constructed for the city’s protection. Nizwa is a characterful place of itself, but is also the natural gateway to the historic sites of Bahla and Jabin. A local pass-time, that is definitely one we’d recommend is dune bashing. This involves hurtling up and down the desert dunes of the Empty Quarter in a 4×4 vehicle. It’s a bit of an adrenaline rush, but the expert driver guides know what they’re doing and lots of experience. The wadis, the lush desert oases are very popular with the locals who like to relax, picnic and hike. The Wadi Al Arbeieen is only a short distance from Muscat and can include an excursion to a Bedouin home. Why not enjoy a luxury private mobile camp in the desert, on the coast or in the mountains – or all three! Travel between sites on camel channeling your inner Lawrence of Arabia, or in a more sedate 4×4. You will dine out under the stars, with wonderful backdrops. The sites are selected to optimise your experience so that you can enjoy wonderful natural landscapes, and peaceful sleeps in the middle of nowhere, with only the noises of nature to break the silence. For a more unexpected Oman, there’s turtle and dolphin watching. There are several types of dolphins so take a boat from Muscat out into the Gulf with one of the experienced guides/captains and keep your eyes peeled for the spinning dolphins or the rough-toothed dolphins as they frolic in the water. To see extraordinary turtles going about their business, Raz Al Jinz is a good start. Whilst there are many beaches where the turtles nest, most are closed to the public for conservation purposes. Raz Al Jinz is the nesting site for several turtles breeds, including Giant Green, Hawksbill or Olive Ridley Turtles. The turtles nest from July to October, and although these can be hot months, the benefit is that there will be fewer tourists. If golf is your thing, Oman is increasingly becoming a recognised golfing destination with several world class quality courses that have now hosted major tournaments. Well floodlit courses mean that even in the hotter months a round of golf can be played in the more pleasant and cooler evenings.